^ (PDF) Special Investigation Report on Emergency Medical Services Operations. PB2006-917001. National Transportation Safety Board. (June 2001). NTSB/SIR-06/01. http://www.ntsb.gov/doclib/reports/2006/SIR0601.pdf 2007年6月26日閲覧. "Brown-out conditions connote in-flight visibility restrictions due to dust or sand in the air." ^ Key, David L. (1999-09-14) (PDF). Analysis Of Army Helicopter Pilot Error Mishap Data and The Implications For Handling Qualities. http://www.aero.polimi.it/~rolando/bacheca/imprimatur/Pilot_Error_Analysis.pdf 2007年6月23日閲覧。. ^ Colby, Lt. Col. Steve (2005年3月1日). “Military Spin”. Rotor & Wing (Access Intelligence, LLC). http://www.aviationtoday.com/rw/training/specialty/1418.html. "Brownouts have claimed more helicopters in recent military operations than all other threats combined." ^ “Vertiflight Breaking News : Army Prepares Brownout Kit”. AHS International. (2004年7月). オリジナルの2007年9月28日時点によるアーカイブ。. https://web.archive.org/web/20070928002658/http://www.vtol.org/news/issues704.html 2007年6月28日閲覧. "The [multi-function display] replaces the standard horizontal situation indicator and shows the crew digital ground velocity, analog vertical velocity, digital and analog radar altimeter, and analog heading symbology." ^ Colby, Lt. Col. Steve (2005年7月1日). “Military Spin”. Rotor & Wing (Access Intelligence, LLC). http://www.aviationtoday.com/rw/commercial/ems/1652.html. ""Pixie dust" is a strange phenomenon often encountered during night brownout landings." ^ Yon, Michael (2009年8月17日). “Kopp-Etchells Effect”. Michael Yon Online (Michael Yon Online). http://www.michaelyon-online.com/the-kopp-etchells-effect.htm. "Sometimes the halos appear like distant galaxies." ^ United Press International. “Rescue Helicopter has Brownout Problems”. オリジナルの2007年9月6日時点によるアーカイブ。. 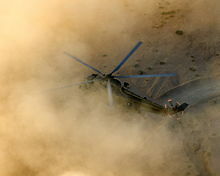 https://web.archive.org/web/20070906190849/http://www.upi.com/Security_Terrorism/Briefing/2007/06/21/rescue_helicopter_has_brownout_problems/8339/. "Data compiled by POGO from government sources show the Chinook flew 7 percent of all U.S. Army helicopter flight hours between 2003 and 2005 but accounted for 30 percent of all brownout-related accidents." ^ en:United States Department of Defense (April 2002) (PDF). V-22 Program Status Report to Congress. http://www.g2mil.com/ReporttoCongress04-2002.pdf. ^ Wayne, Leslie (2007年4月14日). “Combat, With Limits, Looms for Hybrid Aircraft”. New York Times. https://www.nytimes.com/2007/04/14/business/14osprey.html?ex=1334203200&en=4dc39587d0ab00dd&ei=5088&partner=rssnyt&emc=rss. "V-22 downdraft is so strong...that it can create “brownout” conditions...as a result, when rope ladders are used, the V-22 must hover at higher altitudes..."
^ Bahmanyar, Mir (2006). Shadow Warriors: a History of the Us Army Rangers. Reading: Osprey Publishing. pp. 184. ISBN 1-84603-142-7. ^ Chilcote, Ryan (2003年3月29日). “On the Scene : First deep attack”. Cable News Network. http://www.cnn.com/2003/WORLD/meast/03/29/otsc.irq.chilcote/index.html. 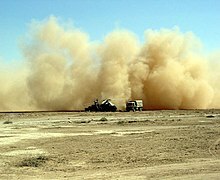 "Right here on the flight line in crash landings, the helicopters landing in what are called brown-out conditions, meaning the dust on the desert floor rises up and engulfs the helicopter and it is very difficult for the pilot to see the ground in those conditions and very easy to mess up the landing." ^ Cordesman, Anthony (2003). The Iraq War. New York: Praeger. pp. 255. ISBN 0-275-98227-0. ^ Skiba, Katherine M. (2003年4月7日). “U.S. helicopter crash-lands in Iraq, injuring pilots, crew”. Milwaukee Journal Sentinel. http://findarticles.com/p/articles/mi_qn4196/is_20030407/ai_n10880884. "Pilots have compared landing during brownouts to parallel parking a car with your eyes closed."